For the second year in a row, Salesforce landed in the Leader quadrant in Gartner’s evaluation of all the leading enterprise aPaaS vendors. GET THE FULL REPORT TODAY. This graphic was published by Gartner, Inc. as part of a larger research document and should be evaluated in the context of the entire document. 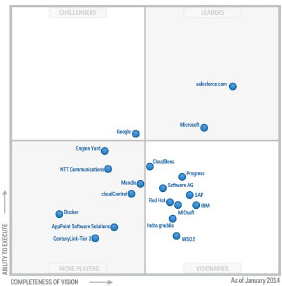 The Gartner document is available upon request from Salesforce.com.